(Natural News) Much to everyone’s relief, our worst-case fears of fatalities and “false flag” violence on Aug. 4th did not materialize, no doubt due to the overwhelming presence of cool-headed patriots. While radical left-wing Antifa terrorists did manage to assault one Trump supporter — causing his skull to bleed on the pavement after a blunt force wound — Portland police kept Antifa terrorists at bay by throwing flashbang grenades and threatening the terrorists with arrest. Antifa terrorists overturned porta-potties and threw rocks and bottles at police, after which the Portland Police Bureau announced the event had been declared a “civil disturbance” and demanded crowds disperse. Unlike in previous engagements, the Portland police did not funnel Antifa terrorists directly into the path of peaceful patriots and prayer groups. To everyone’s surprise, the Portland police seemed to actually do their jobs, perhaps due to the intense scrutiny now being directed at Portland authorities for refusing to respond to federal ICE employees whose lives were threatened by radical left-wing anti-ICE protesters over the last ten days. 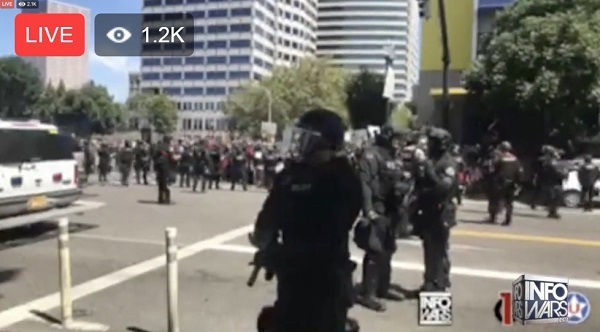 No doubt in anticipation of the threatened violence by Antifa terrorists who openly talked about “bringing guns” to the event, Portland police appeared to be well equipped with rifles, pistols and heavy duty riot gear, once again proving that guns stop violence when they’re in the hands of people who are trying to maintain civility.